Pancakes are traditionally served on Shrove Tuesday - or Pancake Day as it is commonly known. However pancakes are very easy to make and great at any time of the year. Serve them with your favourite accompaniment - lemon and sugar, honey, vanilla ice cream, Nutella and bananas - or whatever you fancy! Makes about 12 pancakes. Sift the flour and salt into a large mixing bowl with a sieve so the flour gets an airing. Now make a well in the centre of the flour and break the eggs into it and begin whisking the eggs, making sure to mix in any bits of flour from around the edge of the bowl. Now gradually add small quantities of the milk whilst still whisking (don't worry about any lumps as they will eventually disappear as you whisk). When all the liquid has been added, use a spatula to scrape any bits of flour from around the edge into the centre then whisk once more until the batter is smooth, with the consistency of thin cream. Now melt the butter in a pan. Spoon 2 tbsp of it into the batter and whisk it in and put the batter into a jug. Then pour the rest of the butter into a bowl with the vegetable oil and mix together. Use it to grease the pan, using a piece of kitchen paper to smear it round before you make each pancake. Now get a non-stick pan really hot, then turn the heat down to medium and do a test pancake to see if you're using the correct amount of batter. About 2 tbsp is about right for an 18cm pan. Carefully pour the required amount of batter into the pan and as soon as the batter hits the hot pan, tip it around from side to side to get the base evenly coated with batter. It should take only half a minute or so to cook; you can lift the edge with a palette knife to see if it's tinged gold as it should be. Flip the pancake over with a pan slice or palette knife - the other side will need a few seconds only - then simply slide it out of the pan onto a plate. Stack the pancakes as you make them between sheets of greaseproof paper on a warm plate while you make the rest. 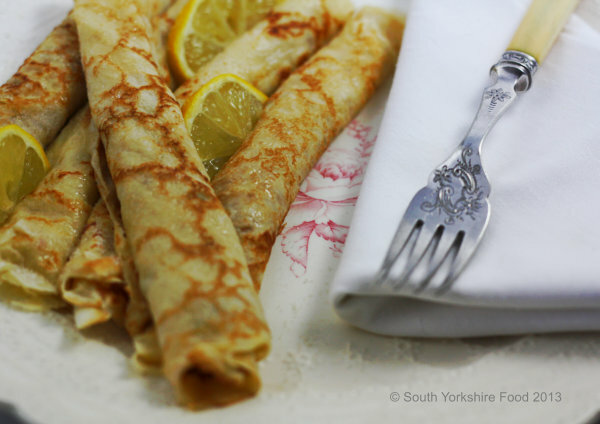 To serve, sprinkle each pancake with freshly squeezed lemon juice and caster sugar and roll up or fold into triangles.